Add the teabags and remove from heat. Remove the tea bags and stir in the sugar until dissolved. Pour into a pitcher and let cool in refrigerator. When ready to serve, stir in the sake and some fresh ice. 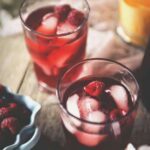 Serve with fresh raspberries to garnish the glasses.